Do you work with florists that sell your products to customers in their flower shops? Are you looking for a way to help them remember your business when it comes time to restock their inventory of gifts and supplies? Thanks to FSNf2f.com, Flower Shop Network's portal for helping member florists manage their website, product inventory and more, florists will have no problem buying from you over and over again! It's all thanks to FSNf2f's My Favorite Vendors tool. This handy tool allows florists to browse through the thousands of vendors on FGmarket.com, and mark certain vendors as their favorites. My Favorite Vendors works a lot like a Pinterest board does: the florist searches through a category on FGmarket.com for a vendor that has what they are looking for, then clicks the star icon in the lefthand corner of the vendor's profile, and then that vendor is saved to their list of favorite vendors on FSNf2f.com. This tool is a great opportunity for you to market yourself to florists in order to convince them to add your business to their list of favorite vendors. When you are considered a florist's favorite vendor, you increase the likelihood that you will be the business from which the florist chooses to buy their wholesale floral supplies and gifts. Instead of having to search through categories on FGmarket, where you are competing against many other vendors, the florist can find your business and contact you when they need to purchase wholesale supplies. So how do you convince a florist to add you to their My Favorite Vendors list? It's a lot easier than you might think. The easiest way to let florists know that you would like to be considered the next time they shop for supplies is to simple ask! Whenever a florist makes a wholesale purchase from you, make a simple suggestion that they add you as a favorite vendor on FSNf2f.com. Let them know that if they are satisfied with your products, then you would be very happy to work with them in the future. This is a great way to start a healthy business relationship between your wholesale business and florists from across North America. Another way to get added to a florist's My Favorite Vendors list is to use the tactic of asking without actually asking. This is exactly what it sounds like. Instead of suggesting directly to florists that they should add you as a favorite vendor, you can convince them to add you by having a good product, being a courteous business partner, and having great customer service. When florists have a positive experience when buying from you, then they will be more likely in the future to continue to purchase from you instead of your competitors. The last way that you can politely convince florists to add you as a favorite vendor is by adding a suggestion to your marketing materials, such as your statement stuffer ads or your direct-to-florist advertising on FSNf2f.com. You can add a small line of text to your ad like "add us as a favorite vendor!" or "add us to your My Favorite Vendors list!" It's a great way to make a subtle suggestion to florists, and puts you directly in front of their eyes! 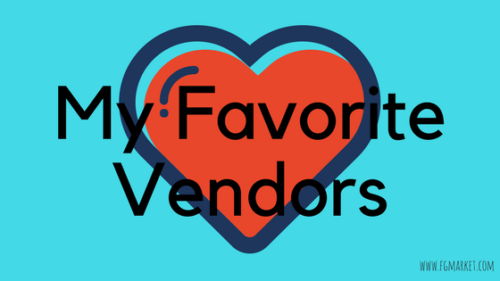 My Favorite Vendors is a fantastic tool for florists to use, and can also help you to earn more business by being selected as a favorite FGmarket wholesale vendor! Encourage your florist friends and business partners to add you as one of their favorite vendors.